Pre-built to save time and money. Multi-channel commerce on SAP is not only optional any more and has become a hygiene factor for survival and profitability for enterprise. Retailers and also manufacturers are increasingly adopting e-commerce in their short and medium term IT road-maps. Our SAP Magento Integration services help business achieve these goals. Many retail buyers also want to ensure that they buy genuine products directly from OEMs. Having product catalogs listed also helps the information hungry audience to research and find relevant information or product specifications. Magento is not only the most popular e-commerce solution but also one of the most robust platforms available used by over half of the live websites across the world in this category. Apart from being affordable, the platform gives an enormous ecosystem with tremendous opportunity to customize, integrate and implement solutions over itself. Community of developers, partners and system integrator are available to meet your requirements across the global. It is thing combination that Magento is still one of the favorites when it comes to launching web-commerce over the SAP box. SAP Magento integration can help you get started at a fraction of the cost you will incur integrating SAP with Hybris or ATG. The solution supports enterprise grade features handling multiple currencies, languages and high volume transactions. Magento has a tremendous ecosystem of developers and consultants which ensure that you never run out of support. The web-store can be configured both in terms of look and feel as well as functionality. There are thousands of plug-ins available for usual business needs. The integration solution consists of the many sub-steps or feature-set. One or more may apply based on a case to case basis. The solution leverages APPSeCONNECT to integrate the application. There are more than 200+ live customers on this platform and Veon is the SAP ECC partner. The top reason for popularity of the solution is that it comes with a hybrid connector which doesn’t store your credentials or transaction data. The solution works with an on-premise Agent which gets mapping and transformation rules from the cloud. It must be noted that this solution has out of the box integration for B2C set up. However for a B2B set-up, the solution has an additional component to first extend Magento with feature-set required for handling this variation. The connector helps you in syncing a catalog structure into the web, so that you can control the tree structure of your web-shop within SAP. The solution then helps you to list your merchandise online on the web. Apart from getting the basic details of the product like short text, long description. It does the following advanced stuff for you. a. Multi-media files – No online store can sell without product visualization. You can define the multi-media files within SAP and the solution will integrate the files with proper SEO considerations. You can have multiple media files associated with a product. b. Configuration Data – in SAP you can define classes and characteristics. The same go into product specifications within Magento. They help end users in sorting filtering and getting additional information of the product. For example, an end customer buying a laptop needs to know the RAM, OS, Hard Disk etc in order to make the buying decision easy. If you are wondering, where you will source the customers from, you don’t have to go too far. The answer is within your SAP system. You can get your dealers and other customers on the web and auto generate a password for them to login and start ordering from day one. The platform brings a truly easy and B2C kind of ease in ordering. An added incentive for customers to order online is that they can see real time information when their goods are dispatched along with ordering history and invoicing details. Not all company contact persons can order items. Hence you need to restrict them as per their role in the organization. The solution enables you to filter the contact persons as per their roles so that you can decide them yourself. Retail customers can also register and buy things online. They are captured in SAP with their exact names and billing / shipping addresses to have a streamlined logistics process in SAP. You can handle the payment methods (Credit Card/Cash on Delivery) as per your business process. The B2B add on makes it possible for the salespersons to be created and mapped into the application. When ordering on behalf of the customer, the partner function with the respective salesperson code can be captured into SAP. This can then help you with commission and incentive calculations and to run other standard SAP reports. Pricing is a complex entity within SAP. The pricing procedure definition and determination can have many variations. The system banks of simulating the prices within SAP and getting them into Magento. The price variation based on customer groups are also calculated and synced between the applications. A critical consideration of the solution, as mentioned earlier, is to have logistics integrated with the solution. When PGI is done in SAP, the information is synced to Magento so that the customer becomes aware of the goods movement. Tracking number if maintained in SAP is also sent to Magento so that this becomes available to the customer. Any B2B sale comes with the associated risk of payment getting defaulted. Credit risk management which helps you to set credit limit at the customer record and execute the checks at various points of time in order to cash process. The solution integrates this aspect so that the business can be done in the same way as it would happen in SAP. The solution helps you in communicating invoice from SAP into Magento. In some cases credit card is used and payment is authorized. This information is also send to SAP so that required information could be synced. On successful payments, the information is synced back to Magento and credit availability is also synchronized. Getting products information is only a part of the story. The solution helps you to sync inventory information along with the products. The solution automatically signals the buyer on availability of the products. The stock managers need to be look into SAP and ensure that they do their operation as usual to maintain the inventory levels and safety stock. They can replenish the same in time and prevent lost orders. Get Started with SAP Magento Integration. Schedule a 15 minutes conversation with one of our experts. Quick words before you see this demonstration. First this is not a walkthrough of the entire solution, but only the initial video of a series. The videos combined, explain each integration point of the solution. So what does this video show? This video is titled Merchandizing synchronization between SAP and Magento shows the following steps. You may continue to watch the other videos on the same YouTube channel. Definition of a product catalog in SAP. Assignment of products into the catalog nodes with appropriate description. Synchronization of product catalog to Magento. Formation of resulting tree structure. Listing of products into Magento with their associated multi-media files. 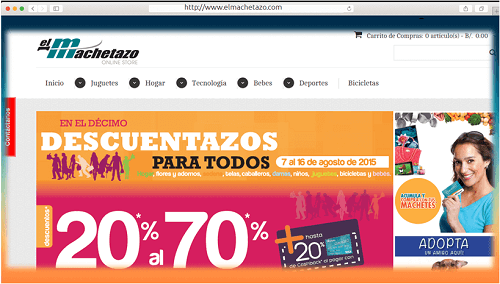 El Machetazo is a leading retailer in Republic of Panama. With over $24 million in revenue and over 3000 employees, the company has 11 physical outlets. The company was already on SAP IS Retail and was looking for a solution which could help drive online revenues. AppsEconnect was chosen as the platform without much of a question. The web-store has surpassed the expectation of business users and come with near zero custom developments within SAP and a flat roll-out time of just over a month. The solution is more than integration between two applications. It’s an investment which can help companies running on SAP to generate an additional channel to source orders from and thus driving both top line and bottom line growth. Following are the added advantages. Without investing any additional manpower let the system generate additional sales and contribute towards profits. Enable the customers with a self service platform which can help them order, track their shipments and pay for their invoice. Having an online store and a payment gateway integrated with the same, helps you in having better cash flow and lesser outstanding payments outside the agreed payment terms with the customers. This is also a driving force among many merchants to take their business online. An integrated solution helps you eliminate the usual business hurdles and puts you in the driving seat. You not only eliminate problems like Order loss due to inadequate inventory levels but also take your business to new levels. For example you can do product launches across channels together, enforce visibility and reward your performing business partners. The possibilities are endless. Unlike many other purely cloud based solution, this solution is secure and safe as it doesn’t store any application credential or any transaction information. Thus the information resides in your network only and thus is foolproof in terms of data security. The solution leverages standard SAP components and objects so that you don’t need to do any custom developments in SAP. This not only saves time to market but also helps in reducing the load on your SAP team. Moreover since there are hardly any custom developments, it doesn’t lead to any complexity in SAP upgrades. The solution is continuously being enhanced and worked upon by an expert team. We are constantly learning challenges which are being faced in retail customers world-wide and are bringing this learning to all our subscribers. The solution comes with two purchase options. First is a one-time buy where you spend a cost upfront and get started. There is however a small AMC amount charged towards the support. This lifetime license cost works out to be $18,000 and the AMC works to be 20% of the license cost and is charged from the second year of purchase. The subscription pricing works out to be $799 per month and is charged on an annual basis. However, it may be noted that customization and implementation cost are over and above the above mentioned cost. Also designing the web-store is not included in the above pricing. The solution also comes with other out of the box integration between popular web-commerce and CRM solutions with SAP ECC box. The prominent ones are listed below with a high level overview of what they do. If you are looking at integrating the cloud based CRM application with SAP, Salesforce is the top choice for you. The solution helps you with exchanging customers and contact information from SAP to Salesforce and helps you in capturing quotes and orders from Salesforce into SAP. Delivery and Invoice information is also sent from SAP to Salesforce. The solution leverages standard SAP objects and uses REST API to communicate with Salesforce. Bigcommerce is the top hassle free online commerce platform which comes with various inbuilt features to make your life easy as a B2C retailer. The solution leverages integration capabilities of BigCommerce and SAP to make it easier for you to sell your products online and receive payments. Getting new customers and orders into your SAP box has never been easier than this. Click on the link below to see how this can become a quick win for you. SugarCRM is the leading commercial open-source solution having a robust architecture and inherent flexibility. If you are looking at a solution which could fulfill the requirement of a large Salesforce team or a dealer network, then SugarCRM makes tremendous sense to you. The solution integrates real time data exchange between the applications and ensures that all the business rules in SAP are triggered simultaneously as the transaction is being done. Copyright 2019 Veon Consulting Pvt Limited.